b = firls(n,f,a) returns row vector b containing the n+1 coefficients of the order n FIR filter. This filter has frequency-amplitude characteristics approximately matching those given by vectors, f and a.
b = firls(n,f,a,w) uses the weights in vector w, to weigh the error. The following illustrates how to design a lowpass filter of order 225 with transition band. Create the frequency and amplitude vectors, f and a. Use firls to obtain the n+1 coefficients of the order n lowpass FIR filter. 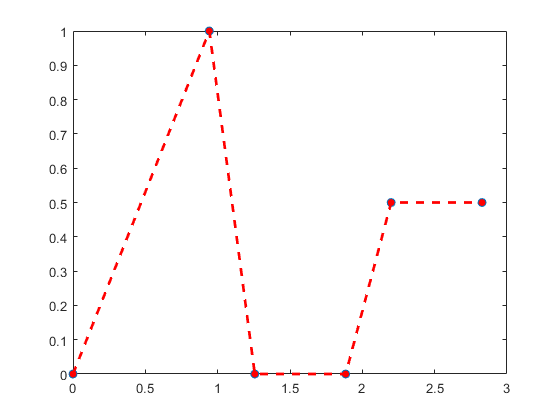 The following shows how to design a 24th-order anti-symmetric filter with piecewise linear passbands, and plot the desired and actual amplitude responses. Use firls to obtain the 25 coefficients of the filter. 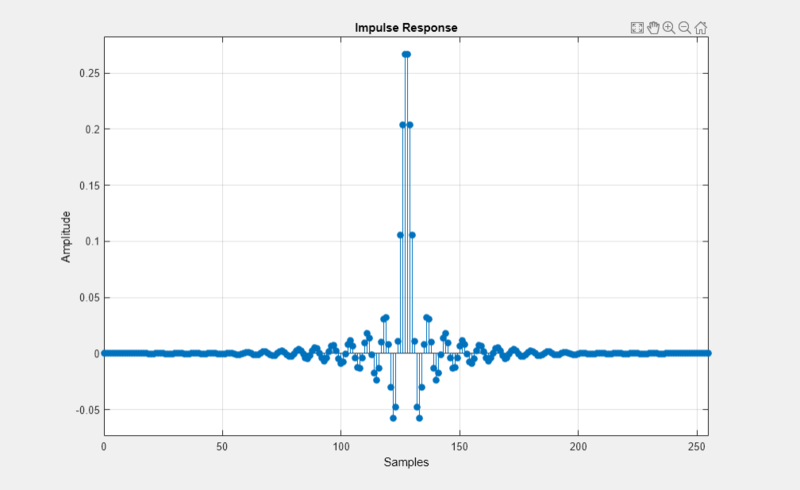 Plot the ideal amplitude response along with the transition regions. Use freqz to obtain the frequency response of the designed filter and plot the magnitude response of the filter. Order of the filter, specified as an integer scalar. For odd orders, the frequency response at the Nyquist frequency is necessarily 0. For this reason, firls always uses an even filter order for configurations with a passband at the Nyquist frequency. If you specify an odd-valued n, firls increments it by 1. Pairs of frequency points, specified as a vector of values ranging between 0 and 1, where 1 corresponds to the Nyquist frequency. The frequencies must be in increasing order, and duplicate frequency points are allowed. You can use duplicate frequency points to design filters exactly like those returned by the fir1 and fir2 functions with a rectangular (rectwin) window. Amplitude values of the function at each frequency point, specified as a vector of the same length as f. This length must be an even number. The desired amplitude at frequencies between pairs of points (f(k), f(k+1)) for k odd, is the line segment connecting the points (f(k), a(k)) and (f(k+1), a(k+1)). The desired amplitude at frequencies between pairs of points (f(k), f(k+1)) for k even is unspecified. These are transition or “don't care” regions. Weights to weigh the fit for each frequency band, specified as a vector of length half the length of f and a, so there is exactly one weight per band. w indicates how much emphasis to put on minimizing the integral squared error in each band, relative to the other bands. Filter type, specified as either 'hilbert' or 'differentiator'. Filter coefficients, returned as a numeric vector of n+1 values, where n is the filter order. b = firls(n,f,a,'differentiator') designs type III and type IV filters, using a special weighting technique. For nonzero amplitude bands, the integrated squared error has a weight of (1/f)2. This weighting causes the error at low frequencies to be much smaller than at high frequencies. For FIR differentiators, which have an amplitude characteristic proportional to frequency, the filters minimize the relative integrated squared error. This value is the integral of the square of the ratio of the error to the desired amplitude. firls designs a linear-phase FIR filter. 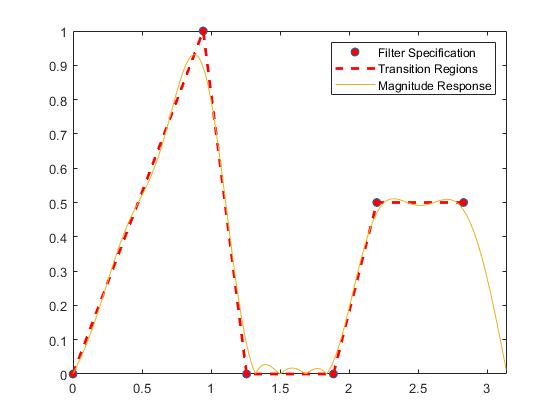 This filter minimizes the weighted, integrated squared error between an ideal piecewise linear function and the magnitude response of the filter over a set of desired frequency bands. This function designs type I, II, III, and IV linear-phase filters. Type I and II are the defaults for n even and odd respectively. The 'hilbert' and 'differentiator' flags produce type III (n even) and IV (n odd) filters. The various filter types have different symmetries and constraints on their frequency responses (see  for details). Parks, T.W., and C.S. Burrus, Digital Filter Design, John Wiley & Sons, 1987, pp. 54-83. Oppenheim, A.V., and R.W. Schafer, Discrete-Time Signal Processing, Prentice-Hall, 1989, pp. 256-266.